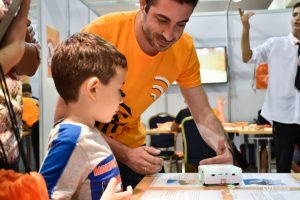 The Research Centre on Interactive Media, Smart System and Emerging Technologies [ RISE ] (http://RISE.org.cy) with additional support from members of the Cyprus Interaction Lab had a strong presence at Βραδιά του Ερευνητή / Researchers’ Night with the participation of more than 15 academics, researchers and administration officers affiliated with RISE and collaborating research labs. 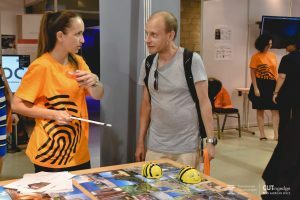 As per annual tradition, the Research Promotion Foundation (http://www.research.org.cy/) has organized successfully the Researchers’ Night, which took place on September 28th and 29th 2018, at the Carob mills, at Limassol. The Researchers’ Night is a Europe-wide celebration for research and takes place in more than 300 European cities in 36 countries. 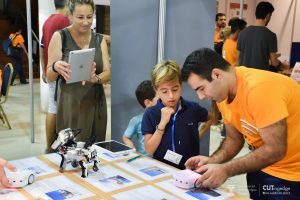 The aim of the event is to promote research and technological achievements to the general public as well as to attract young people, via a variety of hands-on activities, live experiments, interactive games, art installations, exhibitions, theatre, talks, demonstrations etc. Under the theme “The Technology meets cultural heritage” the RISE team invited children and adults to find out more about our cultural heritage via the use of cutting-edge and emerging technologies. A set of interactive and hands-on activities were presented, grounded on the use of immersive and interactive technologies for interaction with content on history and cultural heritage. 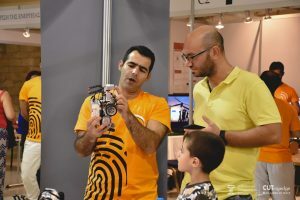 During the Researchers’ Night event the public (children and adults) had the opportunity to take part in a variety of educational robotics activities for exploring historical monuments, navigate within Virtual Reality apps providing 3D representations of cultural and historical landmarks, and use Virtual Worlds and Augmented Reality apps allowing virtual explorations of local museums. Moreover, children and adults had the opportunity to discuss with RISE’s team and learning more about the newly-founded Research center on Interactive media, Smart Systems and Emergent technologies [RISE], its philosophy and its goals. RISE is a newly founded research centre in Cyprus, located at Nicosia. This project has received funding from the European Union’s Horizon 2020 research and innovation programme H2020-WIDESPREAD-01-2016-2017 (Teaming Phase 2) under grant agreement No. 739578, as well as from the Cypriot Government, local and international partners and other sponsors. RISE is a joint venture between the Municipality of Nicosia (coordinator), Max Planck Institute for Informatics (Germany), University College London (UK), University of Cyprus, Cyprus University of Technology, and Open University of Cyprus. Dr Yiorgos Chrysanthou (RISE), Dr Despina Michael-Grigoriou (RISE), Dr Andri Ioannou (RISE), Dr Marios Avraamides (RISE), Dr Marios Kyriakou (RISE), Dr Maria Matsaggidou (RISE), Dr Yiannis Georgiou (RISE), Dr Kleanthis Neokleous (RISE), Mr Kyriakos Zantis (RISE), Mr Giorgos Kyrlitsias (RISE), Mr Christos Gkoumas (RISE), Dr Joe Hettinger (RISE), Mr Styliani Petroudi (RISE), Mrs Shazi Yemehmet (RISE), Mrs Ephie Georghiadi (RISE), Mrs Maria Christofi (GET Lab), Mr Christos Kyrlitsias (GET Lab), Mrs Vaso Constantinou (Cyprus Interaction Lab), Mrs Stella Timotheou (Cyprus Interaction Lab), Mr Chrysanthos Socratous (Cyprus Interaction Lab).